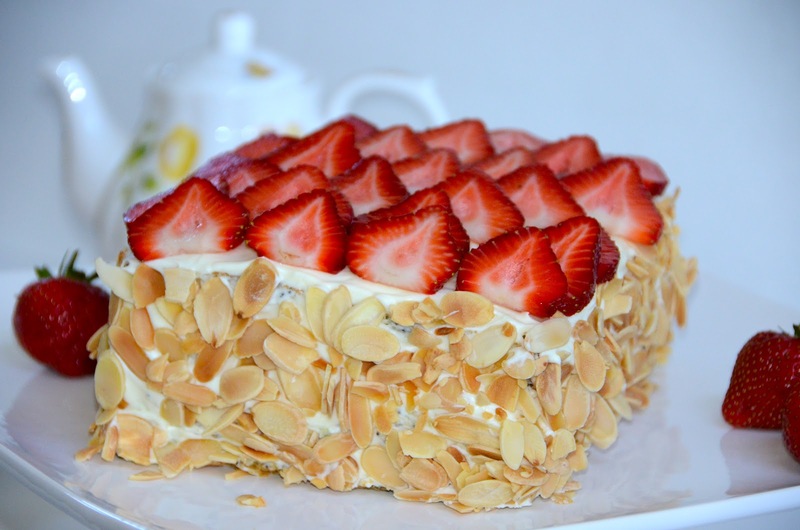 With strawberries in season, why not make this delicious cake.A sponge cake with poppy seeds and a smooth creamy filling with fresh strawberries topped off with more strawberries and sprinkled with toasted almonds on the sides.It’s fairly simple to do and the results are amazing! 8 oz. cream cheese softened at room temp. your choice of Strawberry,blackberry,orange or peach liquor. Or none at all. Bring all the ingredients to a boil in a small sauce pan and let it cool down. In a stand mixer on high speed beat eggs and sugar until the batter will look light and fluffy. Gently fold in sifted flour and poppy seeds. Pour the batter in the baking dish(es). When done baking transfer on the cooling rack and let cool completely. In a mixing bowl or stand mixer on high speed, beat mascorpone and cream cheese. Slowly add condensed milk and continue to beating until nice and smooth. If you’re making the squared cake, cut the cake in half the slice it the other way making total of 4 layers. for the round, slice both cakes in half to make total of 4 layers. Pour /spray the syrup over the first layer. Spread some cream and arrange sliced strawberries on top of the cream.Repeat with the rest of the layers. Sprinkle sides of the cake with almonds. note: This cake is better if served on the day you make it.The strawberries don’t taste fresh on the second day. This cake does have some delicious layers of flavor. Poppyseed cake is tasty by itself but the strawberries and cream really does amp up the flavor. Also, it makes for one awesome presentation. Well done! This looks yummy .on my to do list for this weekend. This looks heavenly, a perfect accompaniment to summer days! I love all the different textures and colours! Lovely. I hear one needs to go to customer's service to be able to buy poppy seeds in the States in some stores. Thank you Tina,Yes its even good with out the cream. Nadia,It's really yummy.Thanks for the comment. Oh my,are you serious? never heard of that…I know they say not to eat it before going to an interview where you need to take drug test, cause you won't pass.silly stuff.lol. This cake looks AMAZING! Is there any way I can use cream cheese with cool whip instead of mascarpone cheese? Ofcourse! I think it will be great. 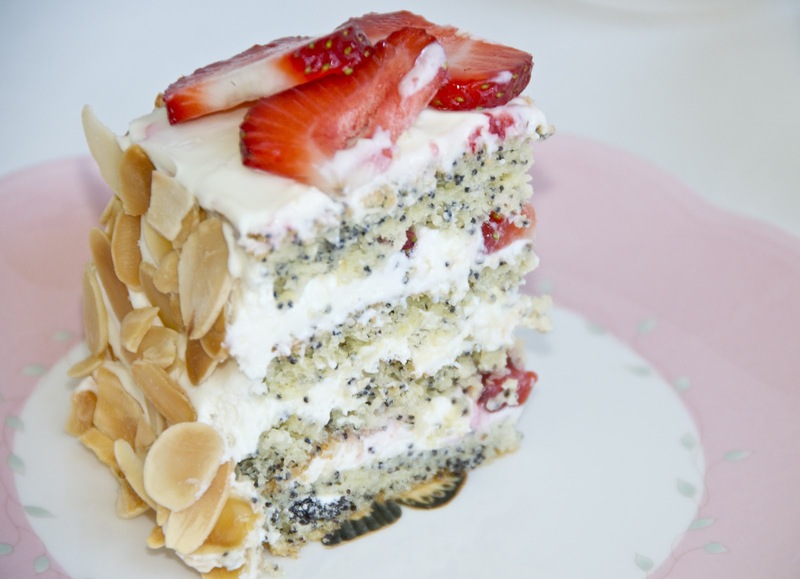 Oh my, mascarpone, strawberries and poppy seed! This is a cake that combines all of my favorite ingredients in desserts! :) A fantastic cake!! Hi Kate, thanks for your comments.I bought them at trader Joes. You can just omit the liqueur. Use water mixed with sugar.